“Everlasting” is a memory brought to life that will always be with you. 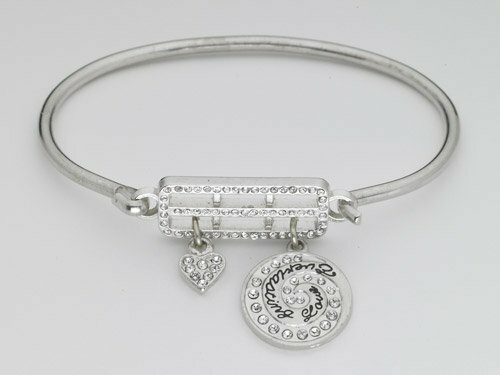 A stunning bracelet for keeping the memory of those passed close to us and honoring them in the way they deserve. The front of this gorgeous bracelet is a window shape lined with Swarovski crystal that symbolizes our loved ones looking into our life from beyond with hope for our success. Attached to it are two charms- a circle and a heart, each of which plays a role in our lives. The amazing circle charm is a circle entwined within another circle to represent the never-ending love that we share with those who have passed and will see again one day. The second charm is a shining heart, to signify that our loved ones will remain in our hearts forever- part of us, always. Finally, the elegant band that joins the window and charms to our wrist symbolizes that love is eternal and that the bond of love that we share with those we cherish holds us together through this world and the next.